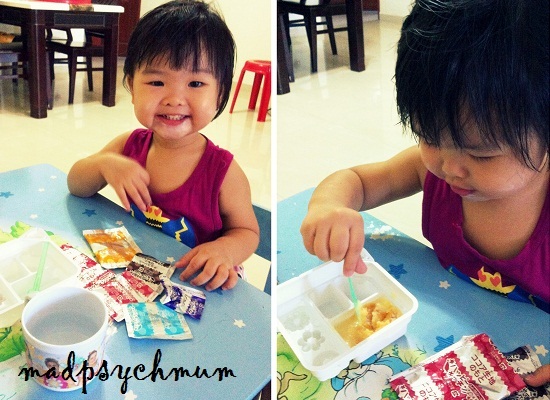 My colleague gave me two boxes of Kracie Happy Kitchen (i.e mini edible food) to make with my girl. 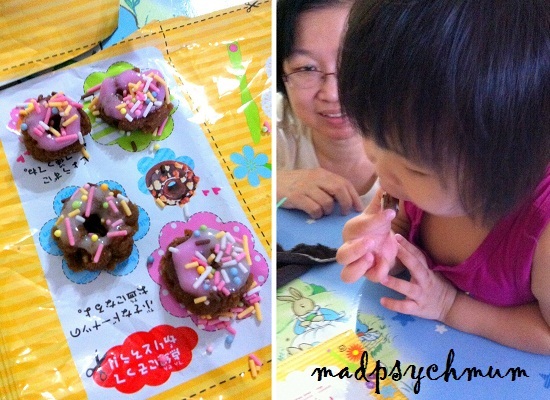 We decided to make it our New Year's Day activity and since we only had time for one, she chose the mini donuts. After laying out all the materials, I was at a loss of what to do next because the instructions were entirely in Japanese, which obviously I didn't know how to read. 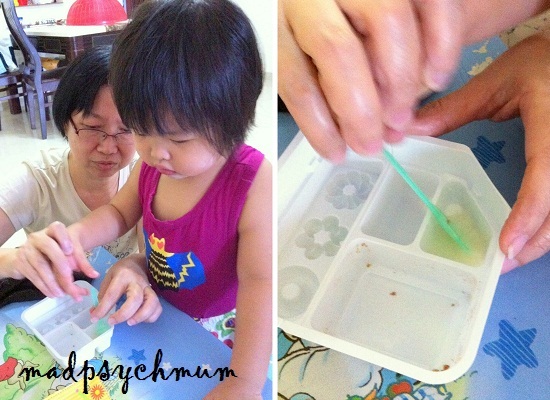 So I tried to figure it out by trial and error and by looking at the photos at the back of the box. First we added water and the orange packet (according to the instructions) into the biggest part of the tray and mixed them together with the spoon provided. It was supposed to be the dough for the donuts but I added too much water by accident and the mixture came out too gooey. Thankfully there was another packet of dough mix (chocolate flavour) for me to try again. This time, I put much less water, mixed it more evenly and ended up with five round balls of dough.. success! Next, I pressed the dough into the mold inside the tray (see tray above) and made 5 little donuts. While I was molding the donuts, my mum-in-law made the icing with the help of my girl. All you need to do is to mix one of the smaller packets of powder with a teaspoon of water. You can make 4 different flavours of icing! We only made 2 since we only had 5 donuts (I ruined the first batch of dough remember? *laughs*). 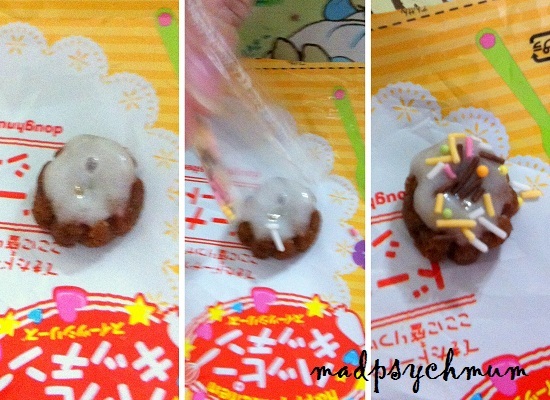 And then top off the donuts with your choice of icing and colourful sugar sprinklers! 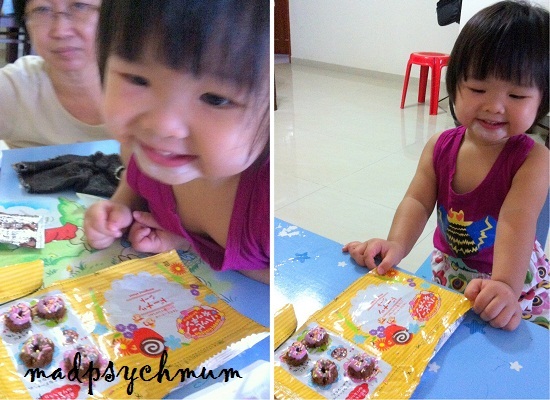 Finally given the permission to eat the cute donuts! My mum-in-law felt it was a little too much work for just 5 tiny donuts but seeing the excitement on my girl's face to have "Playdoh" that she can eat (don't worry, I warned her that Playdoh can't be eaten), it was worth the time and effort. Girlee was so excited that she wanted to make the burgers as well but we need a toaster for that so I'll have to save it for another post.